Crazy Dangerous was, for me, a very fast read. 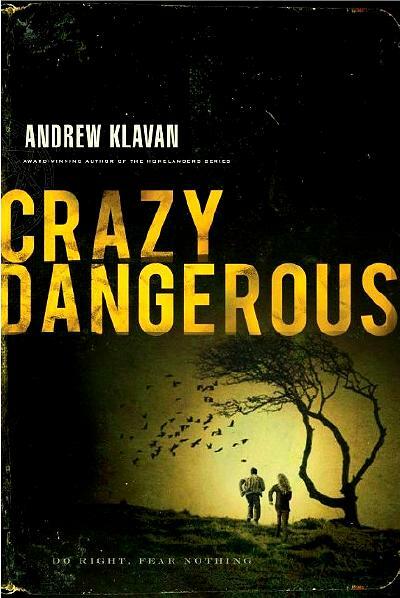 I thoroughly enjoyed it and so did Lars Walker: "Klavan’s ‘Crazy Dangerous’ is Crazy Good." Andrew Klavan has taken a small (but worthwhile) detour in his writing career over the last few years, producing top-notch thrillers aimed at the Young Adult audience, published by Christian publisher Thomas Nelson. His previous four books, The Homelanders series, brought the Christian YA field to a whole new level. All in all, I think the stand-alone novel Crazy Dangerous is even better. One improvement is the narrator/hero of Crazy Dangerous, Sam Hopkins. Unlike Charlie West, the hero of the Homelanders books, Sam is not an adolescent James Bond, outstanding at everything he does and equipped with a black belt. Sam will be far easier for most kids to identify with. He’s a smallish, not very popular, not academically outstanding, not very athletic teenager, struggling with the challenges of being a preacher’s kid in a small town in upstate New York. When he receives an odd offer of “friendship” from three of the shadiest kids in his school, he gets involved with them, just to escape the public expectations that face every PK.